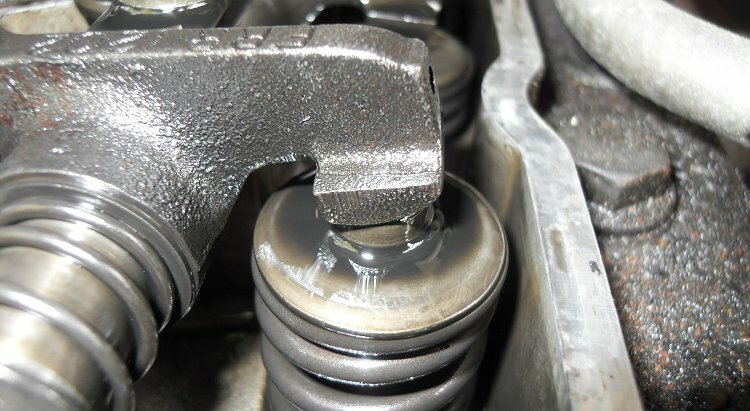 Adjusting valve clearances is a Land Rover servicing task for every 12000 miles. Its purpose is to measure the gap between the top of the valve cap cap and the face of the rocker arm to allow for expansion of the valve stem when the engine is hot. Bascically it makes sure that the valves are opening far enough to let air and exhaust in and out, and closing far enough to seal the cylinders. It's a very simple process with simple tools to help keep your Land Rover running on its best performance. It make be a cure for a heavy tappity noise from the top of the engine. The process here is for a 200Tdi (Defender or Discovery), but is similar for a 300Tdi and takes about 20-30 minutes. The valve clearance we are aiming for is 0.2mm or 0.008 inches. Remove the long 8mm screw from the cyclone breather unit and undo the oil drain pipe, and the pull the unit from the rocker cover. Undo the three 8mm screws on the Rocker cover and remove them with their washers. Remove the rocker cover and keep a note of where the "half moon" seals end up. There are two and they may be stuck to the rocker cover seal or left in the cylinder head. You will see the complexity of the rocker arms before you. The rocker arm is pushed up on the left by a push rod connected to the camshaft, which pivots the rocker arm and pushes down the valve on the right into the cylinder, and thus opening it. In between the valve stem and the rocker arm face is a small valve stem cap which are cheap to replace and take the brunt of the hammering to reduce wear on the other components. It is the gap between the valve stem cap and the rocker arm that we are measuring, and it must be done when the valve is closed (rocker arm at its highest) and when the engine is cold. To get a rocker arm to its highest position, the rocker arm at the opposing end of the cycle has to be fully depressed. It works in the rule of nines, so that if the 1st rocker arm is fully depressed, the 8th rocker arm will be at its highest position, 2nd and the 7th, and so on. You will need to put the 30mm socket and wrench on the crank bolt at the bottom of the engine to turn the crankshaft and make each arm rise and fall. There is some resistance as you do this, but would be easier if you remove the glow plugs. Ensure you move the engine clockwise when looking at the front. When the rocker arm for that valve is at its highest, put the 0.2mm feeler gauge between the rocker arm and the valve stem cap. If it slides easily, check the gap with a 0.25 feeler. If this also goes in smoothly, the valve clearance is too big. If there is stiff friction with the 0.2mm feeler then the valve clearance is too small. The feel we are aiming for is a slight bit of friction, but not pinching the feeler. If the clearance is not 0.2mm then you will need to adjust it. Each of the rocker arms has an adjuster nut around an adjuster screw. Place the ring end of the 13mm spanner over the nut and hold the screw with the screwdriver as you undo it until you can turn the screw freely. Let the spanner hang and adjust the screwdriver whilst moving the feeler to see how the resistance changes. Watch the video below to see how the feeler gauge resistance will change as you adjust the screw. When the valve clearance is correct, hold the screwdriver and tighten the nut to 16nm. The nut will sometimes move the screw a little and throw the clearance out, so check it again when the adjuster nut is tightened. Now you can move onto the next valve. Rotate the crankshaft and watch for the valve that is at its lowest. Take its position away from 9 and that is the next valve to adjust. When they are all done you need to replace the rocker cover and tighten the cover bolts to 4NM and the put the breather cyclone back on. The rocker cover gasket can be used a few times, but mine was knackered and leaking so I replaced it. You can put the half moon seals into the cylinder head first and put some RTV sealant around so that they won't come out in future and prevent any leaks. Only a couple of my valves were slightly out but it pays to keep on top of this to so that your 200Tdi or 300Tdi engine is always in the best condition.